I love Halloween. I think I always have. It’s the candy holiday, what’s not to love? But there is something confusing about Halloween to me. Every other day of the year we tell our kids two very important things: do NOT talk to strangers and do NOT accept candy from strangers. And then we send them out on Halloween. Sure, sweetie, go on up to that neighbor’s house we don’t know and knock on their door. Ask them for some candy. Oh, and then let me check it for razor blades before you eat it. It never fails to seem very strange to me. And if it’s confusing to me, it must be weird for the kids, right? Although my daughter has never said anything of the sort to me and I never remember thinking anything of it when I was a kid. Weird. You know another thing that is weird to me? Candy corn. I’ve never liked it. Not the taste or the texture. 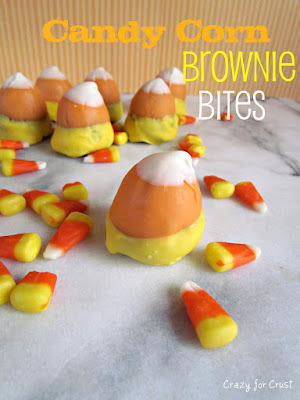 But this kind of candy corn? This kind I could like. My daughter bought me this brownie pan ages ago. 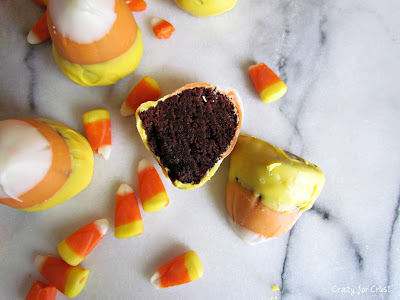 I’ve been trying to figure out how to use it and then I had an inspiration – the brownie bites are sort of shaped like candy corn. Perfect, a candy corn I could like! It’s a brownie dipped in yellow, orange, and white candy melts. 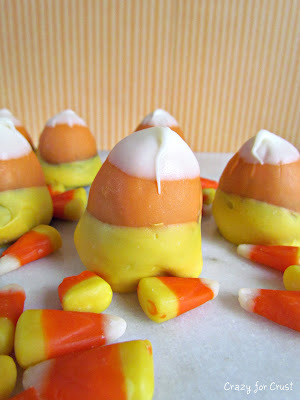 Or, in this case, orange and white candy melts with some of the white dyed yellow. Because of course Michael’s would be out of ALL of their candy melts right when I decide what I’m making for Halloween. There must be a lot of bloggers or do-aheaders around me because that always seems to happen when I go shopping. These are oh-so simple and oh-so good. It’s the honest truth – I ate all of them. If you don’t have one of these brownie pans, you should get one. I’ve got a few other cute recipes coming that uses it. And the ideas keep coming! First, melt your orange candy melts in a small but deep microwave safe bowl. Hold the brownie bite by the bottom and dip it upside down 2/3 of the way into the orange melts. Place on a wax-paper lined cookie sheet and chill until hardened. Next, melt your white candy melts. Dip the orange tip of the brownie bite in the white, forming the white point at the top of a candy corn. Return to refrigerator and chill until set. Last, melt your yellow candy melts. 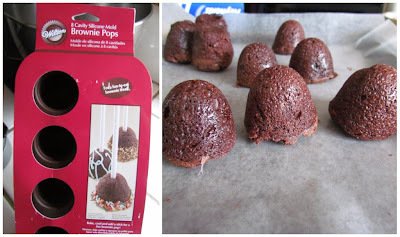 Hold each brownie, white point side up, and dip the bottom in the yellow melts. Place back on the cookie sheet and chill until hardened. Note: If you cannot find orange or yellow candy melts in your store, buy candy color (NOT food coloring) and add it to the white candy melts after melting. What do you think is creepiest about Halloween? Thanks for your sweet comment. I’m glad you found me! 🙂 If you try them out, let me know what you think! great idea for using that pan!